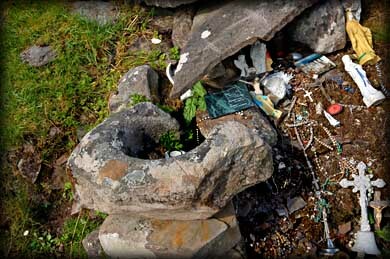 Stations 3 and 4 of the Ballyvourney Turas are located at one of the pilgrimages main features St Gobnait's grave. It is a small prehistoric artificial mound with what looks like a megalithic cist at it's centre. 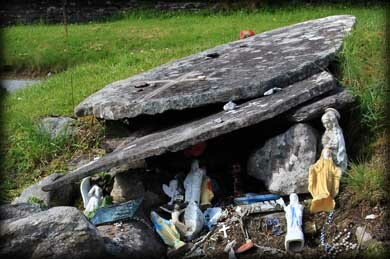 It is highly unlikely that St Gobnait was buried in the cist. Located at the south side of the mound is a large stone slab, which may mark the spot of her burial, as pilgrims have scratched a cross onto the slab. This is station 3 of the turas. 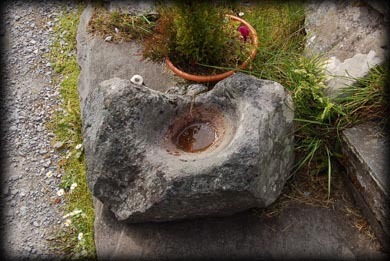 Station 4 is the slab on top of the cist which also has a cross scored by pilgrims. 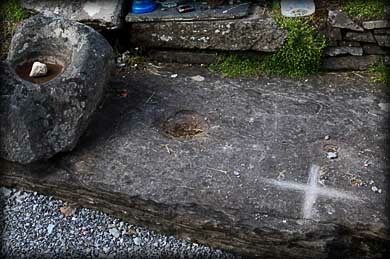 There are also said to be three bullaun stones present , the third bullaun may be in the slab at the front of station 3. Situated: From St Gobnait's House head west toward the church. The grave is located in the church grounds on your right. Discovery Map 79: W 1971 7686. Last visit July 2011. Photos: Jim Dempsey Deb Snelson.